Discreet Cat (TrueNicks,SRO)'s stud career may not yet have matched the scintillating racetrack performances that saw him rated as a world champion at 3, but he's having a very strong year in 2013, standing second only to stud-mate Hard Spun (TrueNicks,SRO) among U.S.-based third season sires. All four of Discreet Cat's 2013 graded stakes winners are out of Mr. Prospector line mares, including the Sands Point Stakes (gr. IIT) victress Discreet Marq and juvenile Debt Ceiling, who captured the Bashford Manor Stakes (gr. III). What makes this duo rather interesting is that they are the only starters sired by Discreet Cat out of mares by Marquetry (and they are out of different mares), making the nick a 100% graded stakes producing one. 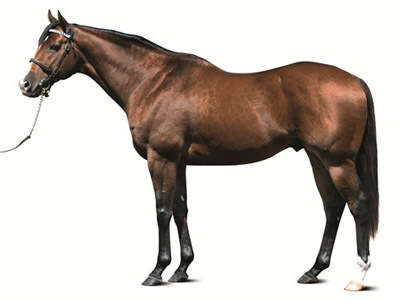 Marquetry is a grandson of Mr. Prospector, and Discreet Cat has a shown a stronger broad affinity for Mr. Prospector line mares than did his sire, Forestry (TrueNicks,SRO), despite Forestry's third dam being three-quarters related to Mr. Prospector's dam. To date, six of Discreet Cat's 10 stakes winners are out of Mr. Prospector line mares, including his other two 2013 graded scorers Discreet Dancer and Sage Valley. The combination of Storm Cat with Marquetry mares has also been good in general, with eight stakes winners from 90 starters. Perhaps that's down to the similarity between the pedigrees of Storm Cat and Regent's Walk, the dam of Marquetry, both being Northern Dancer over Nasrullah/Spy Song. The success of the Discreet Cat/Marquetry cross inspired us go back and look at a blog piece from more than 3 1/2 years ago, when we considered a few other "mega nicks" such as Distorted Humor (TrueNicks,SRO)/El Prado. At the time, Distorted Humor was three-for-three with mares by El Prado. Oddly enough, he's only had two more runners out of El Prado daughters since then, and one of those is the graded stakes-placed colt Abraham (a foal of 2010). However, the pointer to Distorted Humor with El Prado's sire, Sadler's Wells, has proved a good lead, producing two stakes winners since the article was written: Irish champion 2-year-old Pathfork and French group I scorer Aesop's Fables. Street Cry then had grade I winner Seventh Street and grade III scorer Street Magician (TrueNicks,SRO) from two starters out of mares by Meadowlake. He's only had one starter on the cross since, although he does have an unraced 2-year-old filly out of a Meadowlake mare. That one is bred by Darley, who stand Street Cry, and reminds us that as Street Cry's profile (and stud fee) has risen, there would be far fewer Meadowlake mares qualified to go to him. It also reminds that there are times that a stallion's success can carry him out of reach of what has worked best for him. Another cross that was two-for-two at the time was Empire Maker with Lord At War mares, which had grade I captors Pioneerof the Nile (TrueNicks,SRO) and Icon Project to its credit. This will be one to watch in the next year or two, as there are three Empire Maker 2-year-olds on the cross waiting in the wings. Even more intriguingly, there is a 2011 colt called Pure White Stones by Pioneerof the Nile out of a Lord At War mare (Lord At War 3x2). Another remarkably high-scoring nick that comes to mind is Lemon Drop Kid (TrueNicks,SRO) with mares by Cherokee Run, which has produced stakes winners Kid Kate, Donoharm, and African Violet from four starters. Lemon Drop Kid is by Kingmambo, a Mr. Prospector/Nureyev cross, and another son of a Mr. Prospector/Nureyev cross, Afleet Alex (TrueNicks,SRO) (by Northern Afleet (TrueNicks,SRO)), is two-for-two with Kingmambo mares. Funnily enough, Afleet Alex and Lemon Drop Kid combined are not far off a mega nick with Saint Ballado, as between them they have four stakes winners (three graded) from 18 starters out of Saint Ballado mares. We suspect there are several other instances of remarkably high-scoring crosses out there, and we'd be interested to hear of any that our community might want to point out.